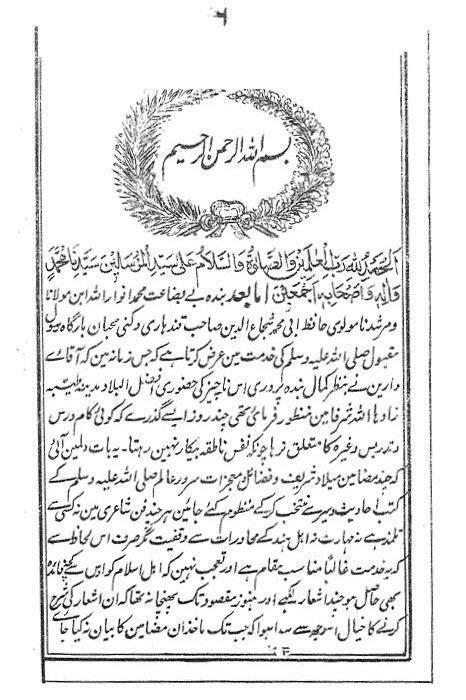 For those who are not aware, let me share that Imam Ahmed Raza Khan (rh) issused the fatwa of Kufr THIRTY YEARS ( 30 ) after Tadhir al nass, was written! This is another deobandi confusion that they do not know that in this 30 years, so many fatwa of kufr was already issued on tadhir al nass ! Deobandis either do not know this or dont want to share this with people! As I have told , before we start”what is objetciobale” in tadhir al nass ,we must see scholars verdict on this tadhir al nass . All these schlars before Imam Ahmed Raza khan (rh) also took passages from 3 diffeent parts of the book , as the deobandis say regarding Imam Ahmed Raza khan (rh). In his book” As sahabus Thaqib” Mawlana Hussein Tandvee, gave few arguments to prove that four scholars of Deoband against whom the fatwa of kufr was issued ( by 33 scholars of harmayn sherif and 268 mufti of undivided India) were innocent . 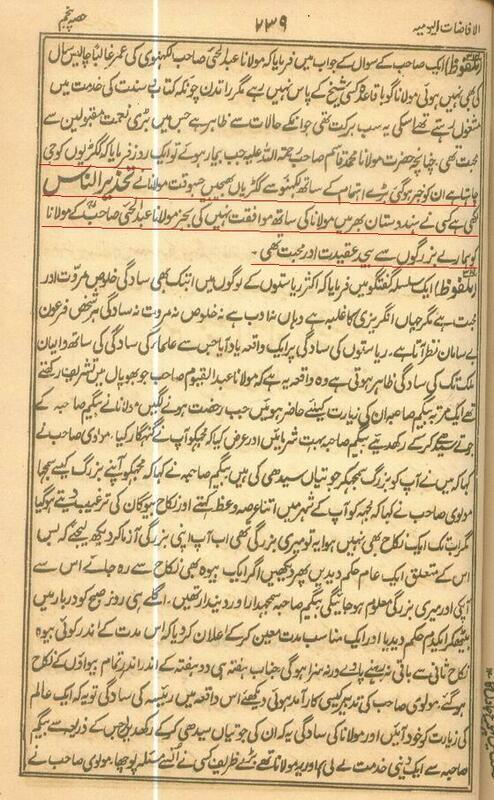 Mawlana Tandvee gave an argument that it was a “ trick” of Imam Ahmed Raza Khan (rh), that he took three different passages from Tadhir al Naas and made them look like 1 complete paragraph and by this way Imam Ahmed Raza Khan deceived Arab scholars who could not understand Urdu . So as per Mawlana Tandvee ( and other deobandis) if these passages are taken independently they do not constitute kufr, but when combined together it gives the meaning of Kufr. Another argument which has come up in recent time is that the part “ takheer zamaney mein bizzaat kuch fazeelat nahee” ( Tadhir al Naas) was partly translated in Arabic as “ la fadhla fih asla” and the word” bizzaat” was not translated into Arabic, had it been translated into Arabic, then it would have made the things clear for Arabic speakers. Though , this second argument does not hold any weight , I have mentioned it , for the sake of academic interest. It has been the modus operandi of the deobandis that they have always been fabricating books to suit their desire. We already have seen scans of fabrication on this forum( insha Allah more in pipleline) and the thread of “ kissing thumb” is another example of it . Insha Allah,this fabricated work of Imam Suyuti (rd) along with As shahabus Thaqib will be dealt in detail in future. 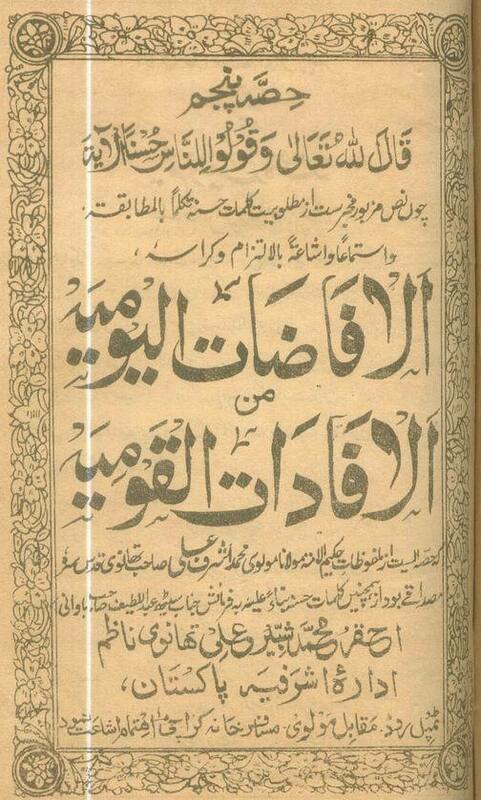 In 1291 AH Mufti Hafiz Baksh Badyuni wrote a refution to tadhir al nass with the name”Tanbihul jihaal bi ahlaamil basasatul mutaal”. 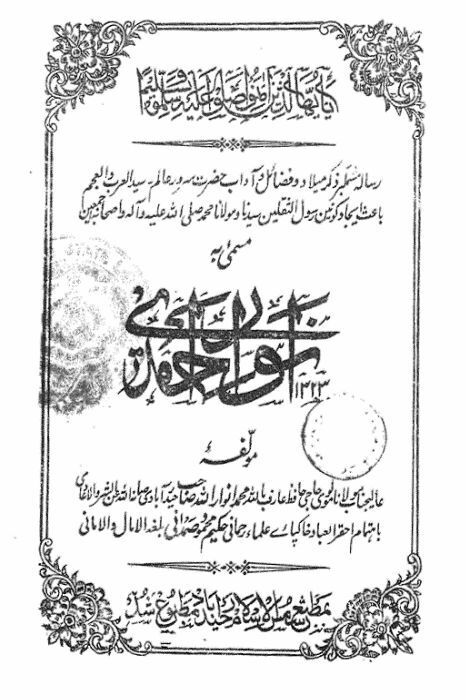 In the same year Mawlana Faseeuddin badayuni also wrote a refutation to tadhir al nass, under the name” Qawlul Faseeh”. There was so much up roar against this book that mawlana Qasim Nanotvee had to hide his real name when he used to travel to other city. “ This division of prophethood into “ nabuwwat biz dhaat and nabuwwat bil ard is crossing the limit set by Quran ( zyadatee) and is mere following own evil desire ( hawa). 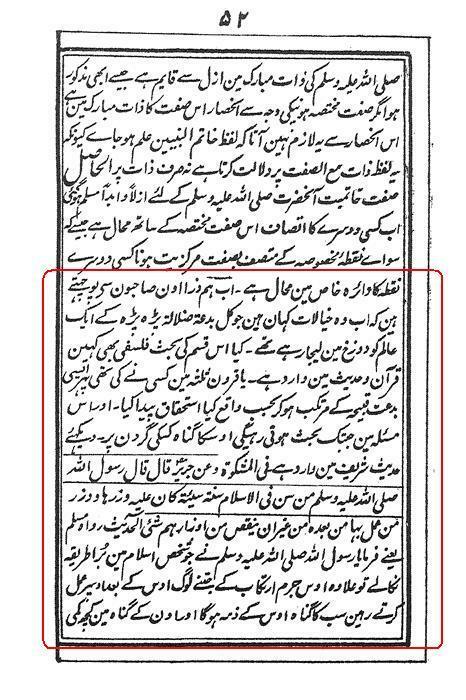 Same Anwar Shah kashmiri al deobandi calls this division of prophethood as impressible ( NA JAYAZ. Mawlana Anwarullah Farooqi (rh) who was the khalifah of Haji Imdadullah Muhajir makkii (rh), established Jamia Niazamiya ,Hyderabad , India. He wrote a book “ Anwar e ahmedi” in which he dealt this “new interpretation “of khatamau nabiyyen given by qasim nanotvee. This book has taqreez by Haji Imdadullah makii (rh) himself. “This servant has seen this book from beginning to end and found that it contains truth and correct sunni belief”. This book refuted tadhir al nass and uses comments like” is such a philosophical discussion even found in Quran and Hadith? Did any one from the first three century told this? Then from where does this type of biddah comes from…..
Mawlana Farooqui has dealt this topic in detail and has even proved from ilmul kalam that this division of prophethood by Mawlana Nanotvee was baseless and is not accepted in Islam. My motive right now , is not to deal with the contents of Tadhir al nass( which ,insha Allah we will do later) but to show that this book was rejected by their Spritual guide and his khalifah! “ It does not matter how many statements of Nanotvee is brought to support his tawil( interpretation) it is clear that Nanotvee sahab is having the same understanding which these MIRZAEE ( Qadyani) present . From where does the thought of another prophet coming in future comes from?. “There is no Nabi after me “ and from other nusoos it is clear that birth of any Nabi is muhaal and na mumkin .If some one says that even birth of another prophet will not make any difference to ”khatme nabuwwat” then we reply” It does make a difference , because by this statement the aqida of khatme nabuwat becomes null and void! If some one says”Suppose if a partner of Allah is born , then this will not make any difference in Tawheed, then is lie and baatil because this will erase the basis of tawheed . 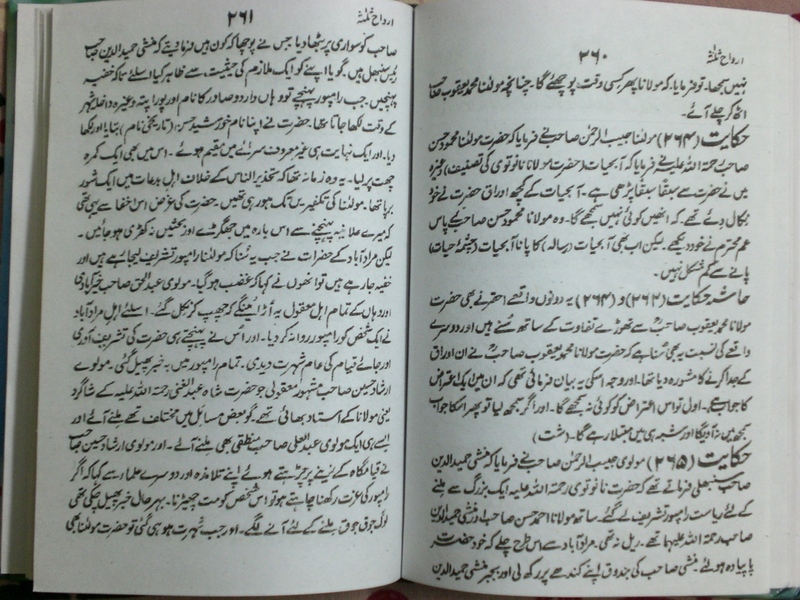 Salafi Mawlana of Pakistan Yahya Kondalvee in” matar qatal hadeed” and Mawlana Abdul Ghafoor in ”hanafiyyat and mirzaiyat ,page 140-141, have called the statement in tadhir al naas as MIRZAIYAT ( kufr). Note: Insha Allah as I recover from my bad health I will scan a very clear fatwa of Kufr upon mawlana Qasim nanotvee from darul uloom deoband. These evidence are sufficient to refute those who are not aware when was tadhir al naas compiled. The deobandi brothers should now stop this slogan that” Imam ahmed raza took three different passage to give a menaing of Kufr”. Every one can see , as Mawlana Thavee wrote, no scholar in India accepted tadhir al nass . Mawlana Qasim nanotvee himself admits that all the scholar of delhi ( except wahabi scholar nazeer hussein) issued fatwa of kufr against him. In another place mawalan qasim nanotvee shows his anger on hasan nanotvee and says” what was the need for him to publish this book’! now the deobandis will say that all these scholars before imam ahmed raza also took passages from three different places! I have heard elders saying that to understand bareli-deobandi conflict one must know history as well.